THE mess that has befallen the supporters of Hereford United took a fresh turn today, as the club have now been suspended “from all football activity” by the FA. While this looks like bad news, there’ll be some Bulls’ fans who will be pleased at this development, as they’ve been protesting against unfit owners for a long time. Over at protest blog, We Want Our Club Back, they’ve long railed against the people in the boardroom at Edgar Street, notably the chairman Andrew Lonsdale and the rest of his team. 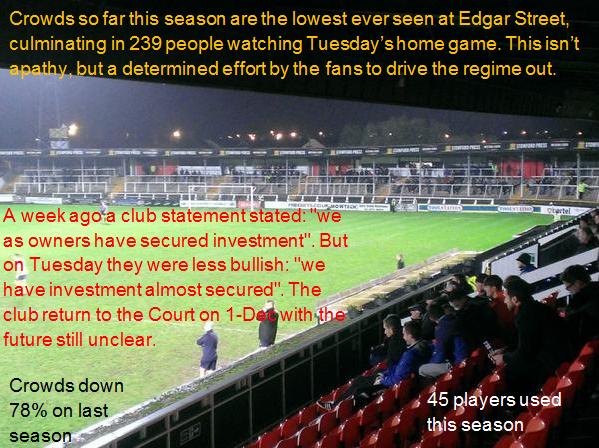 At the Twitter account, Save Edgar Street, fans are chasing councillors for answers about what happens next. Protests have seen mock funerals and supporters boycotting games while sharing their plight on social media and to anyone who will listen. Now that Alpha Choice Finance, a company that is described as a “purchaser of distressed debts,” has been removed from the football club by the FA, after former owner Tommy Agombar failed the FA’s fit and proper person’s test, chairman Andy Lonsdale has now taken over the club. Hardly ideal. All the while, pressure is being applied by The Hereford United Supporters’ Trust who want to buy the club from a string of dreadful characters. Previous owner Tommy Agombar decided to resign the club from the Conference and take them down two divisions to the Southern League, for no good reason. While the owners have changed, fans still fear that Agombar is a huge influence at the club and it looks like, through all this, there are plans for their historic Edgar Street stadium to be sold. You see, Andrew Lonsdale is a friend (and advisor) of Agombar’s. What is raising the anger of Hereford fans is that Lonsdale’s record is bleak. For years, he ran his local non-league club, Feltham FC. The short version of what happened there, is that Feltham left their ground because it was on prime property space, were promised a new one, didn’t get it, and now they’ve had to merge with another side, Bedfont. Hereford’s ground just so happens to be in the middle of a lovely cathedral town, so a prime location. Regarding the Feltham case, using the old ground as a dumping area, the London borough of Hounslow investigated and said that Lonsdale had “a clear conflict of interest” between his position at the club and his involvement in the company paid to do the work, noting that they couldn’t rule out that he made significant money from his company being paid by other construction firms to dump excavated waste. And now, Alpha Choice have passed ownership to Lonsdale and the club is expected in court next Monday to contest a winding-up order. What next for Hereford, who have invariably given English football fans one of the most cherish moments in the entire history of the domestic game – Ronny Radford’s screamer when they shocked Newcastle in the Third Round of the FA Cup. Now, the club may not even exist by the time the Third Round weekend comes.